It was nearly a week ago that I crouched down on a sidewalk, haphazardly halving myself in two, to examine the underside of a milkweed leaf, grasping the tip and turning it over, ever-so carefully, to hunt for something slightly larger than a human eyelash. When you decide to dig up the side yard of your home and transform it into a pollinator garden, you begin to notice the small (the bees, the wasps, the butterflies) and, once accustomed to the small, find yourself fine-tuning your anatomical lenses to the macro (the wingtip of a fly, the foot of an assassin bug, the caterpillar just hatched from an egg the size of a poppy seed). It was when I came through the kitchen door, milkweed cutting in hand, and exclaimed, “I think this one only has two sets!” that I suddenly wondered who I was becoming. I pondered it off and on for hours that day, in between the rest of life’s activities, and finally, as the sun set on the eve of the Labor Day holiday, I realized that perhaps, just maybe, I was becoming who I had always been. I grew up in a house on Mona Lane in the southern suburbs of Dallas. My dad designed the house himself, even though he wasn’t an architect. That should tell you something about our family ingenuity. Our house backed to Mr. and Mrs. Wilson, a retired couple with a big piece of land, separated only from our subdivision lot by a chain link fence and a gate. It was the best place for a kid to grow up. “The Wilsons,” as we called it, was a haven of exploration for me and my little brother. We’d spend our free days visiting their amicable dachshund Velvet in her pen, sometimes climbing on top of her doghouse as she yapped and ran below. We’d try to dig up doodle bugs from their sandy pits under the R.V. carport and search for stray cats under the old trailer by the fence, after which, every time, my mother would lecture us on ring worm. We’d play hide and seek, often stopping to sip nectar from the strings of honeysuckle bushes that created a natural border between their land and the wooded lot next door. We’d play baseball and retreat to a fort under the canopy of a huge wisteria in the front yard, pretending the purple spring clusters were bunches of grapes. But, best of all, we’d wander through the garden. The Wilsons had a huge garden with six or so peach trees and vegetables they rotated throughout the seasons. It was the first place I saw an onion grow and the first place I pulled a carrot out of the ground. With a garden, and that much open space, also came the bugs. I loved nothing more than to take my net and capture insects and butterflies, ushering them into my bug box and crouching to study them closely. My favorite were the lacewings. It was hands-on learning, devised by me, and I soaked it up. I thought for certain, in my elementary-aged mind, that the best accomplishment in life would be to grow up and have a garden. I guess, looking back, it all makes sense. It makes sense that I would have talked my husband into buying a lot next door to our inner city Houston home, scraping the old burned shell of a frame that resided there and putting three thousand square feet of vegetable rows in its place. It makes sense that the next step would have been to build a coop for a handful of chickens. It makes sense that we would then move back to Dallas and I would dive headlong into running a classroom garden at my son’s private school. It makes sense, after that, that I would absolutely refuse to settle on a home for purchase unless it had just the right land surrounding it. I guess when I look back, in all honesty, I’ve been jockeying to have space my whole adult life…space to become “The Wilsons.” So when I excitedly entered the kitchen with what I believed to be the first Monarch caterpillar hatchling, I guess I was really that same little girl wandering with a net in hand, now just doing it in a forty-something body. And, hey, that forty-something body can still crouch. To date, my husband J. and I have hatched twenty-seven chrysalises into butterflies from caterpillars collected out of our Dallas-based home pollinator garden…four Queens, six Pipevine Swallowtails, seven Eastern Black Swallowtails and ten Gulf Fritillaries. Despite our end of summer chrysalis success, we’ve been waiting with bated breath for the Monarchs to arrive. I actually wouldn’t even claim the Monarch to be my favorite butterfly. I have a penchant, honestly, for the Buckeye. But the Monarch bears a unique quality unlike any other species…it performs a two-way migration just like a bird. North Texas sits as a hub, with its runways open from late August through mid-November, for the strikingly sleek orange and black jets to glide in for landing, just a layover, so to speak, on their way to Mexico. It is not uncommon to notice them delicately balancing, en pointe, on the nectar-rich blossoms of Frostweed, Mistflower and Zinnias or to watch them lazily circling above varieties of Milkweed, searching for the perfect leaves on which to deposit eggs. Because of this round-trip travel from north to south and back again, the Monarch lends itself to be an excellent subject for migration research. Enter, stage right, The University of Kansas. Enter, stage left, us. The University of Kansas houses Monarch Watch, a non-profit research program gleaning data from the tagging of Monarch butterflies. At the beginning of August, J. and I sent away for our tagging kit. The goal…tag twenty-five. We are to place a tiny sticker on the ventral hindwing of each butterfly, log some data and then release them back to fly. The idea is that eventually many will be recovered at various places throughout the U. S., Canada and, especially, Mexico. El Rosario and Sierra Chincua are common overwintering sites in Mexico. Monarch Watch partners with guides and members of ejidos, communal farming parcels, to locate tagged butterflies. Locators receive approximately $5.00 for each tag. So why the giddiness over “two sets?” Both the Monarch and the Queen are in the same subfamily. As such, their larvae look very similar and both use varieties of Milkweed as host plants. One clear distinction, however, is in the sets of protuberances, antenna-like structures, on the caterpillar body. The Queen has three, one set of antennae and two sets of filaments, but the Monarch only has two…one set of antennae and one of filaments. For weeks we have had caterpillar after caterpillar after caterpillar with three, three and three, and then Sunday, voilà, two. Thus, the collection began. In between our careers and care of kids this week, we’ve now crouched and collected fourteen Monarch hatchlings. So, we’re over half-way there! Now if we can only turn over the right leaves to find the rest, then ensure their growth and survival to chrysalis stage, we’ll reach our goal of twenty-five. Six Monarch larvae and one Queen take up residence. The journey of our Monarchs is not unlike the journey of this blog, come to think of it. 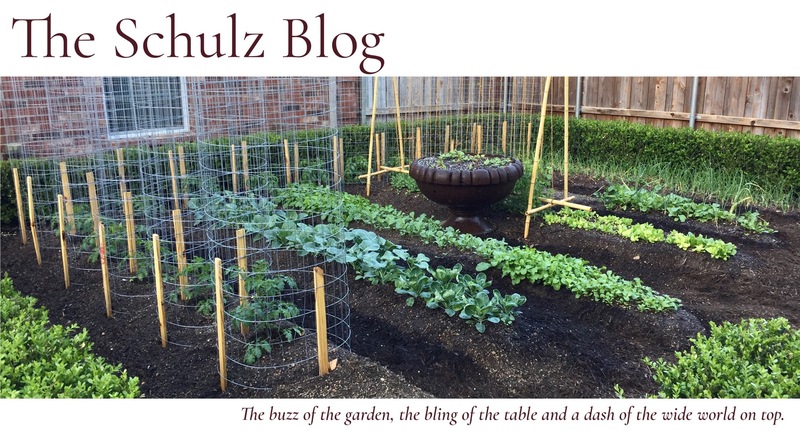 I don’t know where it will lead, but I hope that The Schulz Blog will be a place where readers can stop to learn a little more about the natural world around them, gain some tips on the garden to table process and, hopefully, unearth a few nuggets about life along the way. If you’ve stopped here already, don’t be surprised to glance down and see a small, circular sticker attached to your wing. Let’s see where you will fly. Have a comment or question about Monarchs? Leave a reply below! Love this first of what I hope is a long series of posts. As always, your words are beautiful and so vividly descriptive. Keep going lady!